Being Me is the story of Adele, a girl with a rotten family, an aching heart, and a questionable best friend, it’s a witty, lively novel of growing up female, black, and middle class in contemporary London. As Adele navigates an everyday gauntlet of soccer matches, fights with her best friend, texts and furtive kisses with her boyfriend (her first! 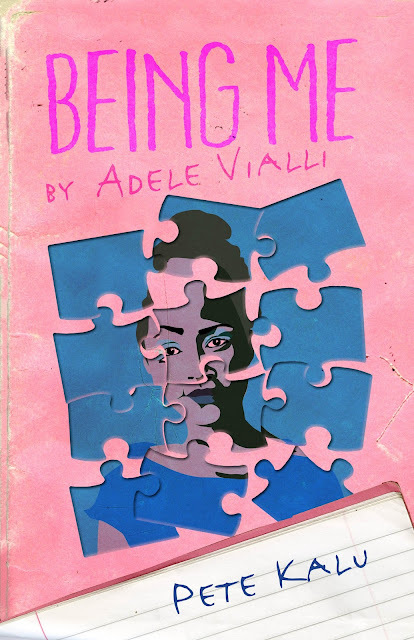 ), and the travails of her screwed up family, Pete Kalu takes us back to those tough teen years, of learning to hold things together in the midst of chaos—and sorting things out by figuring out just who you are, and who you want to be. 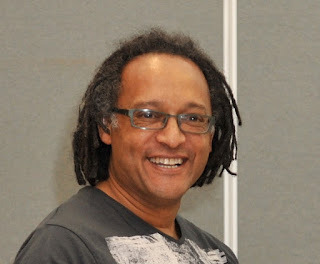 I'm really happy to be kicking off the blog tour for Being Me by Pete Kalu with a piece by Pete on defying gender stereotypes in YA! But there is positive change happening. A recent survey by The Fusion Poll suggests that 50% of Millennials believe gender exists on a spectrum rather than as a strict binary. Put another way, half of young people think gender is not restricted to simple male and female. Instead anyone can have a combination of male and female attributes. In Being Me, Adele expresses her gender in the ways she is most comfortable with. In the first chapter you see her score a brilliant goal, then coolly mime painting her nails. We can be athletes and feminine, she is saying. Anyone attempting to reel in her devil-may-care attitude, her confidence, her nonchalance for other people’s ideas of what being a girl means are in for a hard time! I conceived Being Me as a reworking of the Cinderella story. In the original, Cinders had a talent for dance. In Being Me it’s football. In both cases, it’s all about the footwork! Adele shows some of the traditional Cinders ‘feminine’ tropes – she conforms to the family’s expectations of her by helping everyone - cooking, tidying up, being a good listener. Her family –Mum, Dad, brother, in their own ways, take her for granted. I gave her a brother so the contrast in their treatment could be made apparent: the brother’s sporting achievements lauded, Adele’s ignored; the brother out all hours no questions asked, Adele quizzed and monitored. The driven side to Adele is not all good. She shoplifts, she acts impetuously - Adele does not have much of the stereotypically female virtue of being able to wait patiently - for someone to marry you, rescue you, offer you a job etc. This is a girl who leads, who acts, even if her energies sometimes get misdirected. Yet there is good as well as bad in Adele’s intensity. She forces her mum to finally deal with demons that had been plaguing her for years. So an acknowledgement that tenacity, ambition and irrepressibility of spirit are gender-neutral virtues has been key for me in developing a millennial girl character who does not fall into gender tropes. Adele in Being Me sits alongside some other great non-conventional girl YA characters such as Lyra in His Dark Materials by Phillip Pullman, Sephy in Noughts and Crosses by Malorie Blackman, Katniss Everdeen of the Hunger Games trilogy and the fascinating title heroine in Catherine Johnsons’ most recent novel, The Curious Tale of Lady Caraboo. I received this book for free from HopeRoad Publishing in exchange for an honest review. This does not affect my opinion of the book or the content of my review. Being Me is told from Adele's very realistic perspective, in her introduction she explains that what follows are her diary entries and she apologises that her story isn't neatly wrapped up because 'the way this stuff happened, there was no neat and happy ending', real life just isn't like that. It is this realism that sets Being Me apart from a lot of other YA contemporaries. There is no naive beginning, fraught middle and blissful ending - it's just life. The chapters read like a stream of consciousness; there are observations, unfiltered opinions and contradictions. It is an honest and raw insight into Adele's teenage experience, which is at once individual and universal. Adele's family life isn't ideal, they are dealing with various difficulties but Being Me avoids becoming an outright 'issue' book. The writing is never maudlin or trite and Kalu never tries too hard to make Adele a stereotypical 'inspirational' character, who is overcoming her difficulties with emotional grace. Adele is instead a very real fourteen year old, she's flawed and well-rounded and human. She has good and bad traits and although she isn't perfect she's just trying to get the most out of life. I really enjoyed the representation of female friendship in the novel, although Adele and her best friend Mikaela don't have the perfect relationship they are there for each other in a way that isn't replicated in any of Adele's relationships. Adele and Mikaela are very different from each other but they are also both headstrong and competitive which leads to frequent clashes and conflict that is resolved just as quickly as it begins. I found this to be very representative of teenage friendship; it can be dramatic but that's only because it is based on strong feelings and coming back together after conflict is easy. I really liked that although Adele has a boyfriend, the relationship is in the background, it is fun, sometimes comfortable and sometimes exciting but it doesn't take over the narrative - it isn't her whole life. Being Me is about Adele's life; Adele's life is about Adele and everything else is just a part of that. In Being Me, Kalu has captured the voice of a fourteen year old girl extremely well and this showcases his flexibility and intuition as a writer. I devoured this book in two sittings and would highly recommend this to anyone from ages 14 to 114, but particularly to teenagers who want to read a voice just like theirs. Being Me by Pete Kalu was published on September 17th 2015 and is available from Amazon now!